from A Platter of Figs and Other Recipes, pp. 167-70. Ever since I saw an approving review of Chez Panisse head chef David Tanis’s first volume of recipes in Gourmet Magazine a few months ago, I decided this would be my next cookbook purchase. It wasn’t, but it was quite literally the next best purchase of a cookbook I made. Tanis divides his book into seasonal menus, which is not particularly convenient for browsing — if I’m looking for a recipe by main ingredient, I’d like to thumb through a section on that main ingredient. I quibble. Few cookbooks have as many appealing and seemingly achievable dishes as this one. He concentrates on simple but creative preparations of good ingredients. Without question, the book is worth its price. Reading through it has also inspired me to return soon to Chez Panisse to taste the cooking one more time. And that adventure looks more likely than ever now that Rachel, the daughter of my good friend Sherry, has been hired there to bus tables. Apparently, most employees at Chez Panisse begin as busers. Rachel will clear and set up plates for the cooks in the kitchen for a while and then gradually make the transition to the dining rooms. After that, she has the option of moving on to the wait-staff and possibly beyond that. She reports that the working conditions in the restaurant and café reflect Alice Water’s generosity and commitment to a healthy and content workplace. In addition to full benefits, she has one meal and one glass of wine each shift she works, significant discounts on books, and an even more significant one at Kermit Lynch’s wine store. Alice Waters has made her restaurant a very good and supportive place to work. Season each quail inside and out with salt and pepper and drizzle with a few drops of olive oil. In a small bowl, mix together the thyme, sage, and garlic. Put a small spoonful of the mixture inside each bird. Wrap each bird with a slice of pancetta. Put in a baking dish and refrigerate for up to several hours, or overnight. Bring to room temperature before cooking. Preheat the oven to 400 F. Put the quail breast side down in a shallow roasting pan (two pans side by side is easier) and slide onto the oven’s top rack. When the birds begin to sizzle, after 8 minutes or so, turn them breast side up. Continue roasting for 10 to 12 minutes more, until the quail are nicely browned and crisp and the juices run clear when the thigh is probed with the tip of a knife. Remove the birds from the oven and let them rest about 10 minutes, loosely covered. Pour the polenta onto a large platter. Lay the quail on the polenta and spoon the juices over the birds. Surround with the grilled radicchio. Use 4 parts water to 1 part polenta. Once made, the polenta can sit for another hour. Bring 12 cups water to a boil in a large heavy-bottomed pot over a high flame. Add 2 tsp salt and 3 cups stone-ground polenta and stir well with a sturdy whisk. When the water returns to the boil and the polenta begins to thicken, after a minute or two, turn the flame to low. Continue to stir while the polenta gets its bearings. After a few minutes, it will be bubbling very gently, with the occasional ploop. Stir the polenta every 10 minutes or so. If it seems to be getting too thick, splash a little milk on top and stir it in — do this occasionally, or as necessary. After 45 minutes or so, the polenta should be nearly cooked and ready for tasting. Spoon out a small amount on a plate and let it cool slightly — hot polenta straight from the pot is likely to burn the roof of your mouth. You’re looking for a lush, corn flavor and a texture that’s smooth, not grainy. Now add salt and pepper to taste, and another splash of milk, and stir well. Cook for 15 minutes longer, then taste again. Stir in a stick of softened butter. Turn off the heat and let the polenta rest, covered, for 15 minutes before serving. Covered, it will stay warm and soft for up to an hour. For each serving, count on 2 wedges of radicchio; 4 small heads will yield 8 servings. Peel any damaged or tough outer leaves from the radicchio. Cut into thick wedges and place in an earthenware gratin dish or shallow baking dish. Drizzle the wedges with olive oil and sprinkle with salt and pepper. Preheat the oven to 400 F. Bake on the top shelf for 10 to 15 minutes, until well browned and nearly, but not quite, charred. The radicchio can be cooked up to several hours in advance, then reheated in the hot oven when the birds come out. Fresh quail can be ridiculously expensive ($5 a piece at my local market! ), but I have found frozen packs of farmed quail in the specialty frozen sections of up-scale supermarkets. What’s more, I ignored the “semiboneless.” I don’t mind picking up and gnawing on the little birds and neither do most of my friends. As is clear in the photo, I more than halved the recipe. I had two friends to dinner to eat six quail. They’re appreciative but not big eaters, so I had one quail left over. I prepared the quail the night before. 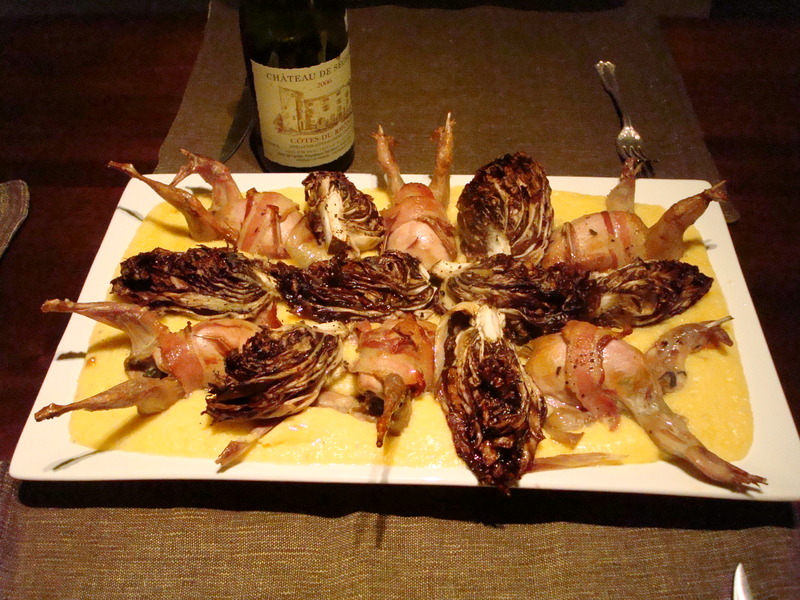 When I began to cook, however, I grilled the radicchio, took it out and covered with foil, and then a little over one hour before I calculated I would remove the quail from the oven, I started to make the polenta. The 10-minutes stirring intervals make coordinating the three elements easy. Because I suspect my oven is running cold these days, I preheated the oven to 475 and then reduced it to 425 when I put the birds in to roast. The cooking times worked perfectly, although the pancetta and quail did not brown as much as I had hoped. Nor did the quail render much juice. For the polenta: I used 2 cups of polenta in 8 cups of water. It drank up nearly a 1/3 cup of whole milk before it reached a creamy state. I cooked the polenta on the lowest flame. After the polenta had cooked for 45 minutes, I put the quail in the oven. Tanis is absolutely correct when he insists in the recipe’s preamble on cooking the polenta for a full hour. The grains softened and dissolved and the polenta came out creamier than I’ve ever made it before. I may use less milk next time. Next time, I may substitute Cornish game hens for the quail. They’re cheaper and they are likely to render more juices. I also may play with the garlic-thyme-sage mixture. If I roast hens instead, perhaps the herbs would do well under the skin next to the breast meat. We drank a Cotes du Rhone but switched to a 2006 Pinot Noir from San Luis Obispo (Tolosa), which we all agreed flattered the food. this is a great-sounding combination of rich flavors as the weather turns colder. i agree that quail can be a bit $$… and somewhat more difficult to work with. nice post! I can vouch for the combination of flavors, Jak. I meant to add one more idea to Final Thoughts. A while back, I did a post on Ruth Reichl’s pot-roast with roasted garlic and tomatoes. That plus the method of making the polenta here is probably the most promising combination of all.